Dr. Diane K. Corcoran was born in Rochester, New York and joined the Army Nurse Corps after completing nursing school in Rochester. 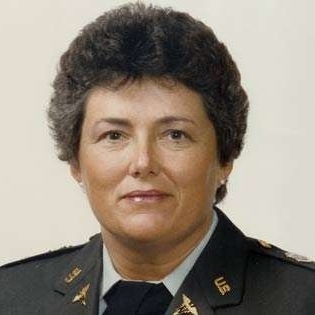 She served in the Army Nurse Corps for 25 years, starting in Vietnam and ending as the Chief Administrator, Frankfurt Army Medical Center, during Desert Storm. During the 25 years she served in the military, she held a variety of positions from Staff Nurse, Director of Education and Nursing Supervisor to Commander of the 86th Combat Support Hospital (CSH). During her time in the service, she also completed a Master of Arts in Educational Psychology and a Doctorate in Nursing Management. After retiring from the military, she became the Director for Medical Services for a technology company that specialized in documentation of injuries during combat and transporting medical records on a computer chip/smart card. She also worked for several health care consulting companies that were contracted by the Department of Defense. Dr. Corcoran is an International expert in the care and support of people who have had Near-Death Experiences (NDEs) and is especially interested in service members and veterans who have had NDEs. Dr. Corcoran has published and presented on a variety of topics related to NDEs, management and grief. She has lectured nationally and internationally for over 40 years on the importance of health care professionals understanding NDEs. In addition, she has lectured on the implications of NDEs for the military and nursing professionals and has provided training in associated areas such as supporting terminal patients, grief and bereavement, SIDS deaths, and other issues related to death and dying. Dr. Corcoran initiated a research fund to explore NDEs in the military and how to better serve these individuals and has published numerous articles on specific to combat NDEs. She continues to counsel people who have NDEs and assists with developing and providing resources and professional workshops on these topics.